Warm up with that special someone with this delicious dish. In a medium bowl combine 1 ½ teaspoons black pepper, 1 teaspoon salt, Italian seasoning, garlic and extra virgin olive oil. Rub seasoning mixture onto chicken. Place the chicken pieces with skin side up in a roasting pan. Pour chicken broth around bottom of pan. In a medium bowl, toss potatoes in 1 tablespoon pure olive oil, 1 ½ teaspoons pepper and ½ teaspoon salt. Place potatoes in roasting pan around chicken and roast for 45 minutes, until the internal temperature of the chicken is 165° and potatoes are fork tender. In a medium sauté pan, cook bacon until crisp, about 8 minutes. Transfer to a plate. Sauté onion in the bacon fat until translucent, about 8 minutes. Add grape tomatoes and cook until the skin pops. Add spinach in batches until wilted. Season with remaining 1 teaspoon black pepper and ½ teaspoon salt. Return bacon to pan. In a medium saucepan, sauté butter and tomato paste for 30 seconds, whisk in flour and cook for 2 minutes, whisk occasionally. Remove chicken from pan and rest on a cutting board, lightly tented with aluminum foil. Place potatoes on serving platter and cover with foil to keep warm. Pour wine into butter and tomato paste mixture and scrape bottom of pan. Cook until liquid is reduced by half. Add chicken broth from roasting pan and bring to a boil, reduce heat and simmer for 15 minutes. Season to taste with salt and pepper. 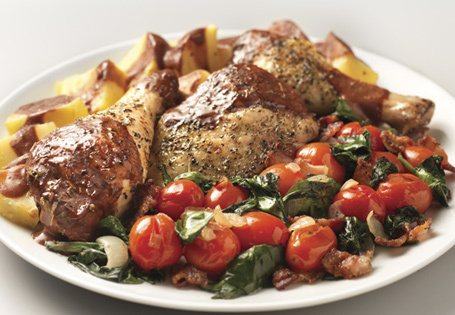 Serve chicken with potatoes and vegetables arranged on plate with sauce drizzled over chicken and potatoes.